Unbounce's Co-Founder Oli has seen more landing pages than anyone on the planet. He speaks around the world spreading the gospel of Conversion Centered Design, and has a legendary disdain for marketers that send campaign traffic to their homepage. Tommy Walker is the Editor of ConversionXL, Host of Inside The Mind, Producer of Page Fights & Founder of Social Filter. His aim is to push the bounds of content, entertainment, and online marketing to create captivating experiences people can't resist. Peep Laja writes the popular conversion blog ConversionXL, and runs the conversion optimization agency Markitekt. He's been doing digital marketing for over 10 years in Europe, Middle East, Latin America and the United States. Crown this month's landing page champion. Hiten Shah is the co-founder of KISSmetrics and Crazy Egg. He's been creating and growing both self-funded and venture backed SaaS analytics businesses since 2005. As an advisor, investor or service provider he's helped dozens of companies with marketing, product and growth initiatives. He is a sought after mentor and advisor to entrepreneurs and their companies. 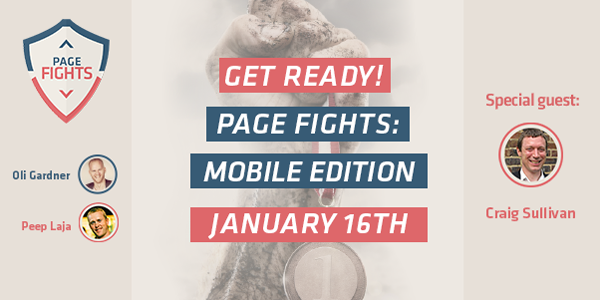 For the next episode of Page Fights, we're looking for ten brave contestants who are from startups to enter the ring and get their landing pages torn apart. Think your design has what it takes to get your page on the podium? Submit your landing page today! Invite your friends to watch live! We've decided to discontinue Page Fights and put our efforts into a new project. To everyone who participated in making Page Fights a success, thank you for your support. We were delighted to have you, and hope you learned as much from this project as we did. To stay in the loop on our next project, please leave your email address below. We've decided to discontinue Page Fights and put our efforts into a new project. To everyone who participated in making Page Fights a success, thank you for your support. We were delighted to have you, and hope you learned as much from this project as we did.